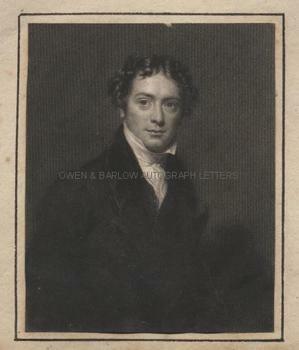 MICHAEL FARADAY Autograph Letter Signed. With a steel engraved portrait. English physicist and chemist who made important contributions to science of electromagnetism and electrolysis. Discoverer of Benzine and the inventor of an early form of the Bunsen burner. ALS. 1p. Royal Institution. March 2nd 1833. To the Egyptologist T[homas] J. Pettigrew. "The Committee of Friday evening begs to thank you for the interesting statement you were good enough to make to the members yesterday evening." 12mo. Approx 5.5 x 4.5 inches. 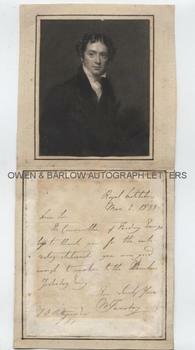 Laid down on card by the original collector and mounted with John Cochran's 1842 steel engraved portrait of Michael Faraday after Henry Pickersgill. Some offsetting from portrait to letter (where this had been folded in an album, some foxing. 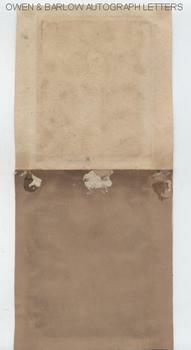 Discolouration and mounting residue to verso of mount. Thomas Joseph Pettigrew (1791-1865), known as "Mummy" Pettigrew, was a surgeon and antiquarian, a pioneer Egyptologist and a specialist in Egyptian mummies. He was well-known in Georgian and Victorian intellectual circles and was a regular correspondent with Charles Dickens, Astley Paston Cooper and Michael Faraday. He gave several talks on mummies, sometimes including a demonstration in which these were unwrapped before the audience. In 1834 he published his seminal work 'The History of Egyptian Mummies'. 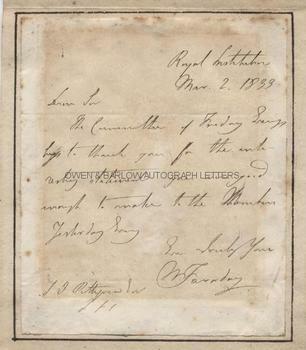 Around this time he gave several lectures to the members of the Royal Institution (the oldest society in the world that is dedicated to scientific research and education) and Faraday is here writing on behalf of its members to thank Pettigrew for his talk.